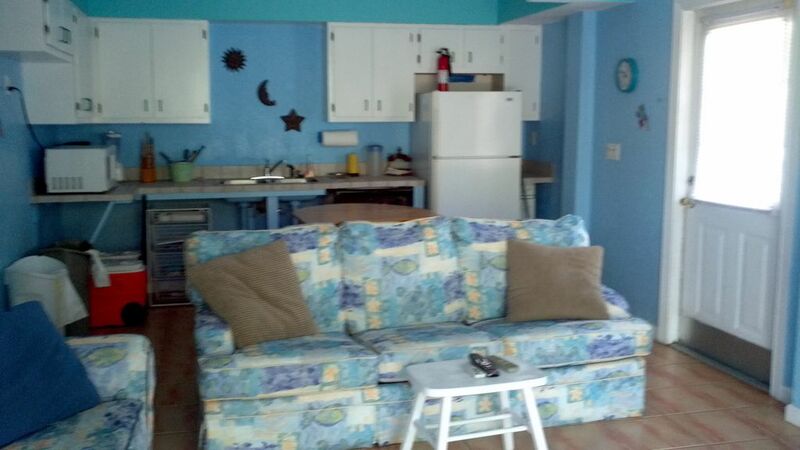 We have provided a fun family beach home for you to enjoy. There is plenty of room with 4 bedrooms and 3 bathrooms for your comfort. There is a master bedroom with a king bed a second bedroom with 4 twin beds, the third and fourth bedrooms have queen beds. This house has all the beach amenities you will need to have a great vacation, towels, beach chairs,umbrellas + a whole lot more. Also we have included many infant items ,playpen, booster chair, and toys for children of all ages. There is a computer with a cable modem connection . Enjoy bike riding to the shops . This very quiet, bright, family house is only steps from the beaches of the Gulf of Mexico. The private beach access is only a 2 minute walk from your front door. More photos available upon request. We stayed in the home for a week with another family. There was plenty of room for everyone. We loved that it was so close to the beach. There we construction on Estero, but that really didn't affect us at all. It was so nice to have the beach chairs, umbrella, beach toys etc, and the wagon was great to haul everything to the beach. The pool was also amazing. We spent many evenings grilling and playing games while the kids played in the pool. The two screened in porches were also perfect for early morning coffee and reading and evening drinks and cards. I would highly recommend staying here. We loved the house and how well equipped it was for families, everything you needed was included. Mike was incredibly responsive and answered any questions we had within a few minutes. Communication with him was terrific. The traffic was heavy with the construction, but we were able to walk across the road to the beach just fine. It was easy to get traffic to stop. Again, not the owners fault but driving anywhere was dicey. We walked to Publix using the beach cart which worked out better than driving there. Being mid-island the beach was fairly empty and just beautiful. The pool a definite plus too. The people who stayed in the apartment downstairs felt the mattress could use updating. All in all a wonderful week, thanks. This house was perfect for 7 friends week away! Location was great just across the street to the beach. Road construction still going on but drivers are very friendly to stop to let you cross the road. We were far enough away from the pier and close enough for walking. House was clean and had everything we needed. Beach gave us amazing sunrises and sunsets and we found some great shells! The house had a large table for all of us to eat around, couches for all of us to enjoy a little TV and screen decks on both side of the house that gave us a cool breeze to enjoy a cocktail and conversations. Pool was refreshing and a large table for all of us to sit. Would rent this house again. Please come back and see us anytime. Great group !! We had a most wonderful stay and love to come back in the future. Owner very accommodating. Very clean. Loved the pool. Did not want for anything. Terrific customers. Come back anytime! This home accommodated 7 adults beautifully. The location to the beach was great. It was nice that beach chairs, umbrella, wagon and cooler was provided to use at the beach. The pool was also nice to have. The only problem that we encountered was the internet not staying up and working throughout our stay. Mike was very helpful on taking care of all our needs. Great house for a family of 8. Plenty of room. Kids loved the pool! Tempature of the Home got to be a little warm sometimes. Kitchen and amenities worked out well. There was a whole room full of pool and beach toys to use! Unfortunately for us it was red tide season and the beach was not good for swimming. But we drove a hour in each direction and used the beach. But thank god for the pool. Hiking, biking, golf, tennis, basketball, fitness center, horseshoes, miniature golf, amusement parks, fishing, wildlife viewing, horseback riding, shopping, restaurants, cinemas, sightseeing, swimming, snorkeling & diving, boating, sailing, water-skiing, surfing, windsurfing, parasailing, jet-skiing, shelling, rafting.